Sewin’, Bakin’ and Lovin it! Ho ho holy moly it’s December! Little Miss Charlotte’s Nursery is complete! Ahh, I love the fall!!! A lot of people think that Christmas is the only holiday that they can dec up the house for. Me? Any holiday where I can make something is a holiday that I can dress up the house! There are so many beautiful ways to decorate! Here are some ideas to utilize all of your crafty hard work and make everyone oooh and ahhh when they come over! Here is how I love to make my home into a place where we love coming home to everyday, and one that our family and friends also love coming over to! First off, a helper is always nice! 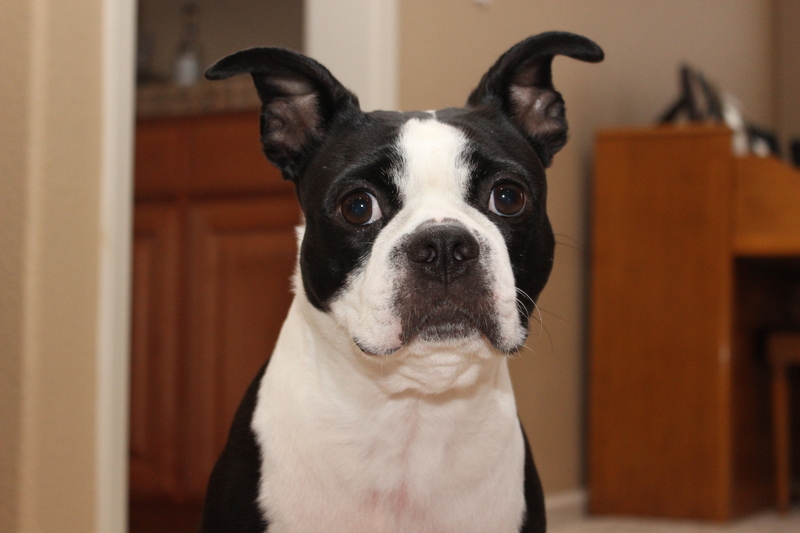 This is Otto, he is always on my side. Loves to pull things out of my bins as I go! We are blessed to have an amazing home, with a lot of storage! Since we only have fur children, we have extra storage in some rooms, as of now. But, as the family grows, how do you manage storage? I am a full believer in having an organized home, and especially an organized crafty space!!! I will be posting some of my tricks and tips on how to organize your crafty space soon! First things first, I looooove all the home decor stores! And I know that I am not the only one out there! With so many wonderful stores, great deals to be had, and all the awesome seasonal decor out there, how do you choose! My husband Charlie always ask, whats that for and where are we going to put it! It’s important to limit your decor habit to what you can store! First Rule: Always make sure that you have a place to store it. I utilize storage bins. After Christmas, there’s always sales on the colored bins, and I took advantage of stocking up on those when I can. I hop on the computer and print out a sign on whats in the bin, that way you can easily find what you are looking for. Take a page protector and use some packing tape and slap it on your bin. I do this with all of my holiday decor. Garlands, wreaths, lights, ornaments and floral picks etc all have their homes. I use gift wrap tissue to wrap everything that can be to prevent all that glitters in check. I save the paper tissue that you get when you buy stuff too. Bubble wrap and the packing that comes when you get all that stuff when you order online is a good tip too. I keep it in a large bag in the closet for future use. I always put the next holidays bins on top, that way you don’t need to pull stuff out from the bottom. Larger weird shaped things get wrapped up in the bags that I purchased them in. The bags that Pier One gives you are perfect for this! In this house, we are always about re-using things! Second Rule: I am always looking for things that I can re-use for multiple holidays. This not only saves you money, but saves on storage space. I love lanterns and apothecary jars. These can be dressed up in so many different ways! I try to stick to the basic colors, black, white and browns. I have some beautiful red ones that I use for Christmas, Valentines and Independence Day. They look great for everyday decor too! Here’s a beautiful large lantern that I got from Home Goods for about $30. I use it all over the house! On my buffet in the dining room, on the floor (if ya don’t have little monsters or crazy dogs around!) For this one, I used a box that I saved from and Amazon order and placed it inside, then I used some gold tissue to place on the bottom. I look for the glass marbles after holidays, they are much cheaper than, and layed them on the bottom. Using the tissue helps add more height inside so you don’t have to use as much. The pumpkin is one of the foam ones that can be carved, placed on top of the box. Then, you put what ever you want inside! Leafs and floral were then added! Love it! The mirror was a steal! It was in a clearance area at Cost Plus, and was further marked down, so it was 25 bucks!!! I always have it there, filling the space up. I have a good stash of vases and jars, that I rotate throughout the house. 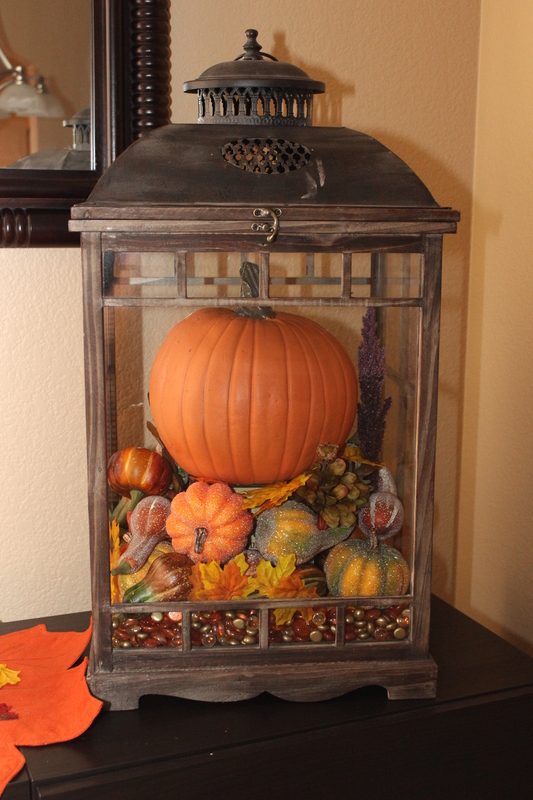 Fill the bottom with glass marbles and put some more of the gourds or potpourri in there, topping with some floral. Same with the apothecary jars. I like to use larger framed photos with photo stands. Flameless candles are always a nice touch, Costco has packs of these and tea lights that I get around the holidays, and the timers on them are perfect! I love coming home to the warmth that these candles give. 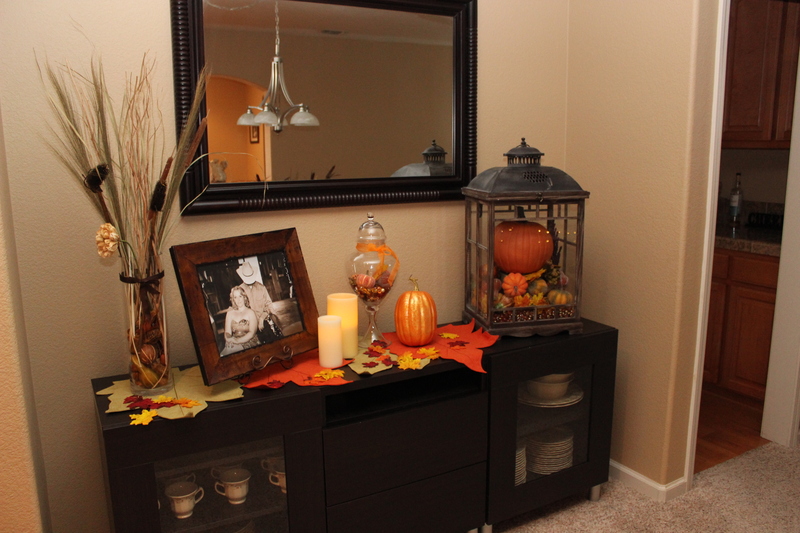 I love having areas in our home that give you a focal point when you walk inside the home. We have a beautiful table that was handed down by my grandmother, and I will always have a beautiful table runner on it. 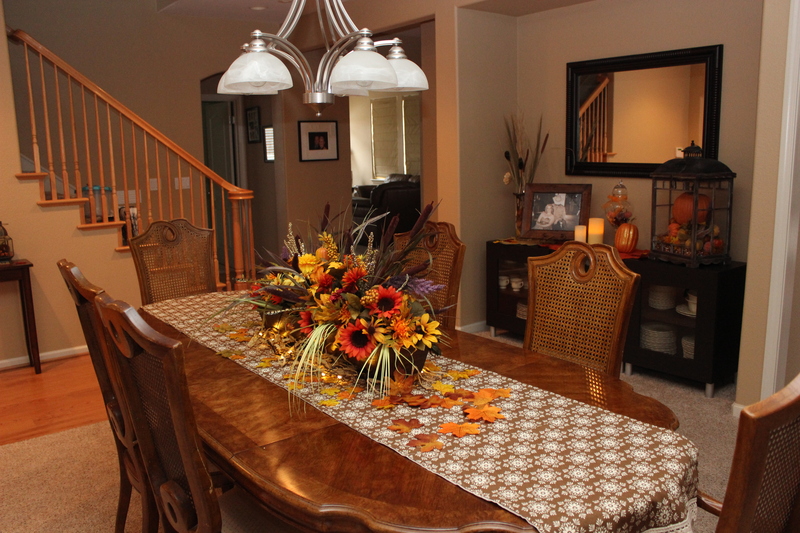 Table cloths are nice, but runners are usually less expensive and they are super easy to make! You can make them longer or have a small one in the center to add that pop of color, without being too outdated or overwhelming for your center piece. I purchased all of the floral from Michael’s when they were 70% off post holiday season! Grab a pair of pliers and start cutting them off the bundle. Lay everything out that you have, you will be surprised of the look when you mix different colors and textures together! The planter was purchased at Home Goods, and I originally bought it for our wedding. It was used on our sweetheart table with beautiful fresh flowers. I saved it and reuse it for holidays! I put 3 blocks of floral foam inside, and used tissue paper to fill in some gaps. This helps in using less floral foam and less flowers. Use the bigger florals first, then add in the smaller taller pieces, taking care that you don’t miss any spots. I do this in the kitchen, so I have a 360 view so I can see which spots I miss, and I always have hubby take a final look to see if there are bare spots. Drop a few leafs around, some raffia. I found the cute vine style LED light string to wrap around and you are done! Place on top of a runner and there we go!!! 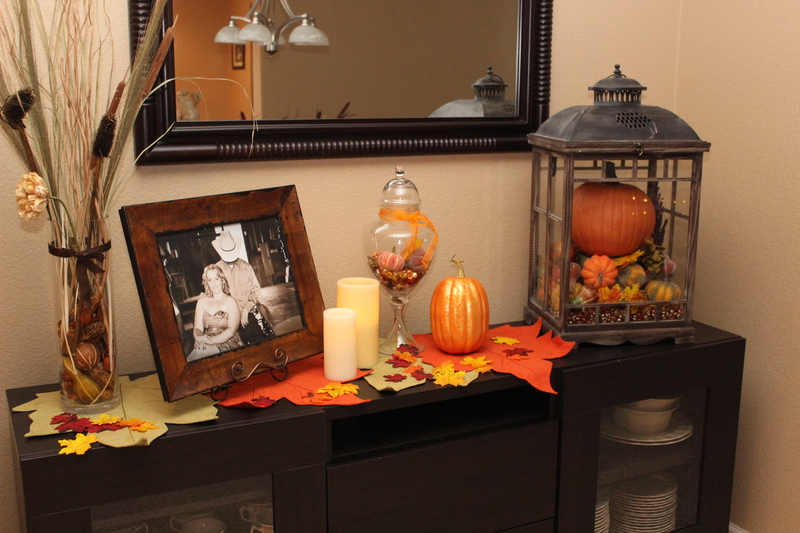 I made this runner for our wedding as well, and its perfect for the fall!! When I make my runners, I try to do a different pattern or style on the other side. I have a Halloween runner, and when you flip it over, it has a Thanksgiving style on the other side!!! This is awesome for storage. All of the floral for Thanksgiving and Halloween lives together in its bin, saving on storage. 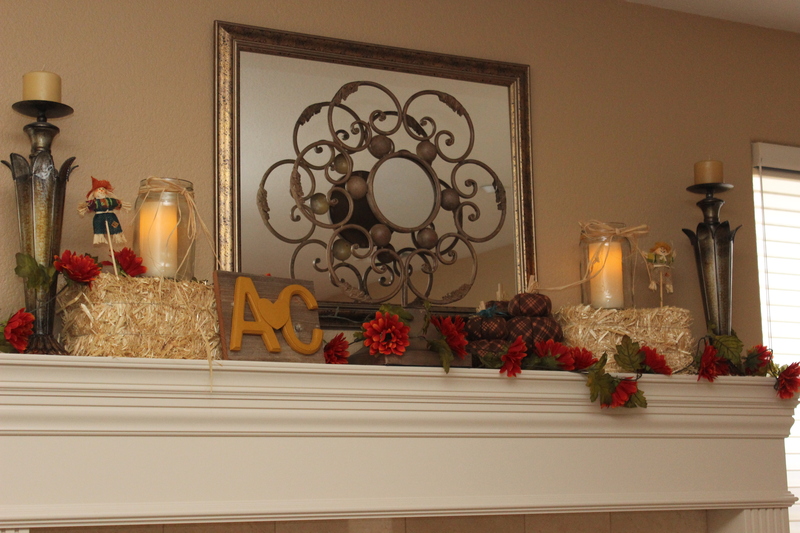 We have two awesome fire places, which means 2 awesome mantels!!! I always have something all year round on these, keeps everything tied together. 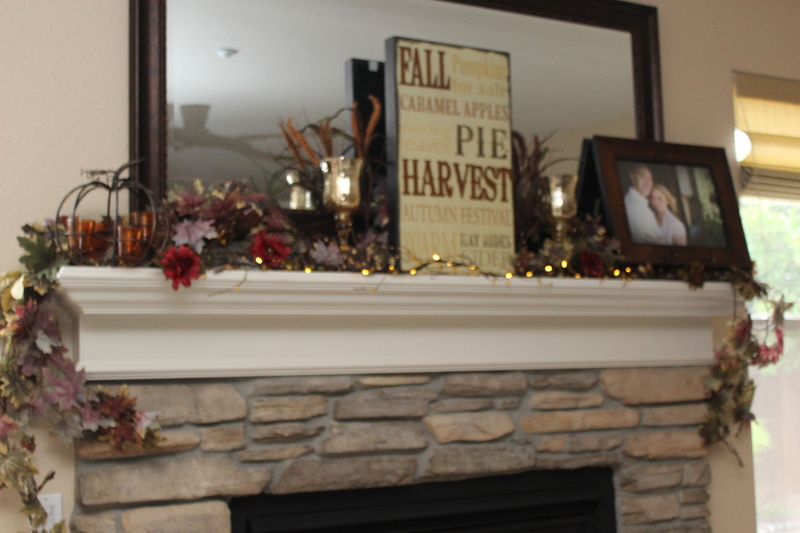 I have garlands with leaves in two different colors and styles that I use. I used another one of the garland LED lights. Simple but beautiful! 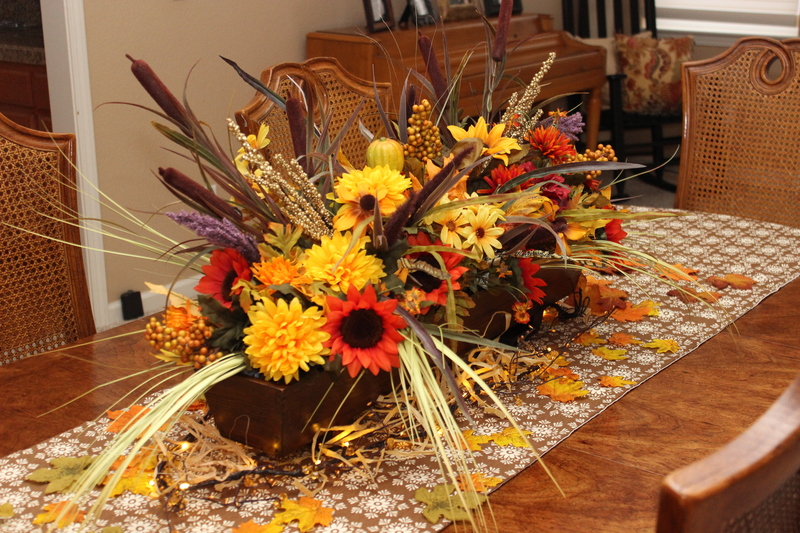 For the dining room, I placed some garland with flowers on it, some small hay bales, candle holders, and some jars with flameless candles inside wrapped with raffia, tied in a bow. Those were wedding leftovers too! You can tie ribbons around as well. The fall time is full of warmth and love. I hope you all enjoyed how I made our home warm and inviting!!! Now, for Christmas decor!! !